A team of researchers at Yamagata University and Teikyo University of Science, in Japan, have recently developed a new roving biologger, or whale rover, which can travel along a sperm whale's body surface and collect valuable behavioural data. Biologging entails the biological tracking of individual animals, typically by attaching small dataloggers directly to their bodies. It can be a very effective way of unfolding the mysteries of animal life, by collecting data and observations related to an animal's behaviour, motion, and biology. "Our project started in 2012. In the previous year, a marine zoologist, Prof. Kyoichi Mori, had consulted with me on how we could tackle a current problem," Prof. Yuichi Tsumaki, one of the researchers who carried out the study, told TechXplore. "We were eager to capture video data of preying sperm whales, because no one knows what happens when a sperm whale eats a giant squid." Traditionally, animals are studied by visually observing their behaviour, habits and biology. However, these visual observation methods are difficult to implement when it comes to researching the ecology of marine animals, particularly those inhabiting the depths of the sea or ocean. Biologging techniques have significantly improved the ability of researchers to study these animals in their natural habitat. In recent years, advancements in electronic technology have led to the development of a wide range of biologgers of different sizes and weights. Biologgers allow researchers to collect key information about marine animals, including their 3-D motion trajectory, diving depth, and swimming speed, as well as physiological data such as body temperature and electrocardiogram readings. Some of these biologgers are also equipped with cameras and can thus collect unprecedented images or videos that depict an animal's predatory or social behaviour. "We wanted to attach a camera logger around the mouth area, with the main objective of shooting footage of a sperm whale eating a giant squid," Tsumaki explained. "To achieve this, we developed a whale rover that has potential to reach the animal's mouth area. The whale rover is based on the 'environment driven concept' proposed in our previous work, in the context of asteroid exploration. To locomote in harsh environments with minimum mechanisms, the energy of the environment is utilized for locomotion. This system should ideally achieve both compactness and mobility at a depth of over 1000 m."
The whale rover developed by Tsumaki and his colleagues improves the visibility of a sperm whale's mouth area as it moves across the deep sea, travelling along the animal's body surface using robotic technology. 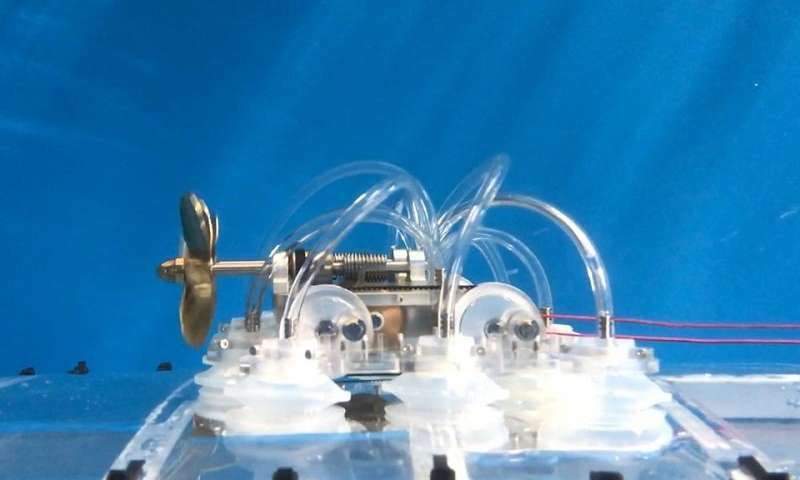 An environmentally driven concept devised by the researchers allows the biologger to achieve adsorption motion, using the water current generated by a swimming whale as a power source, without relying on a distinct central processing unit (CPU) and battery. "We reduced the size by concentrating the valve system, and increased the adsorption force by increasing the suction cup size and flexibility," Kosuke Tsuchiya, another researcher involved in the study, told TechXplore. "We have achieved adsorption walking motion at a depth of 500 m using only the water flow as the power source. Our technology has the potential to be used in the area of not only biologging but also underwater robot applications, such as inspection of submarine cable systems or inspection of the bottom of large vessels." The researchers tested their innovative and environmentally driven whale rover in several field and laboratory experiments. They found that it could successfully travel across a flat acrylic surface at a depth of almost 500 m, which confirms its applicability in deep-sea environments. In water tank lab experiments, the biologger could travel across a 1.5 m radius curved acrylic surface, with a 46% success rate. These preliminary findings suggest that the technology might not yet be applied in real-world scenarios, where it would need to travel longer distances. However, overall the biologger yielded highly promising results, showing great potential for a variety of underwater applications. "Currently, we are designing a new prototype with new suction cup arrangement, measuring equipment and float," Tsumaki said. "These features should allow us to attach the prototype to a sperm whale's body surface for the first time. In the near future, we will conduct experiments in the ocean around the Ogasawara islands."